For years, Marvel fans have hoped that somehow Disney would find a way to get the rights back to the X-Men and Fantastic Four franchises so that they could be included in the MCU. Disney has now purchased most of 21st Century Fox in a deal valued at $66 billion, which includes all of 20th Century Fox. As part of that, Disney has given Marvel fans their wish as the X-Men and Fantastic Four can officially join the MCU now. There's a whole lot more to this deal, but as far as many Marvel fans are concerned, this is the best part of the whole thing. Marvel Studios didn't start making movies until Iron Man came out in 2008. At that time, Marvel had sold off the movie and TV rights to many other studios. 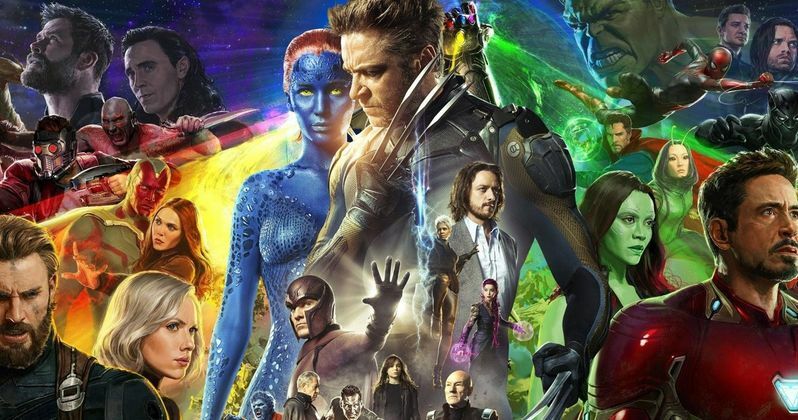 Over the years, Kevin Feige and the brass at Marvel Studios have managed to get most of the lingering rights back, but Fox was making a lot of money with the X-Men movies, so it seemed as though they had no interest in giving up those rights. So instead of buying the rights, Disney just bought the whole studio. This deal raises a lot of questions. For one, Marvel has been pretty quiet on their plans for Phase 4 of the MCU, which concludes with Avengers 4 in 2019. Odds are, this Fox deal has been in the works for a while, which could mean that plans for the future movies couldn't be finalized until this deal was put in place. Granted, the deal still needs to be approved, legally speaking, so the X-Men aren't going to join the MCU overnight and we're not going to see the Fantastic Four hanging out with the Guardians of the Galaxy next week, but it's going to happen in the future. But what of Fox's future plans? The movies set to be released next year, The New Mutants, Deadpool 2 and X-Men: Dark Phoenix, are surely going to move forward as planned, since the deal is going to take a while to finalize. Beyond that, it's a lot dicer. Are we even going to see Gambit actually go into production? What about the R-rated movies like Deadpool, Logan and the proposed spin-off movies like X-Force and the X-23 movie? Are those really going to exist under the Disney umbrella? As much as having the X-Men in the MCU could be awesome, there are some things fans could be sacrificing as a result. Here's what Disney CEO Bob Iger had to say about the acquisition. "The acquisition of this stellar collection of businesses from 21st Century Fox reflects the increasing consumer demand for a rich diversity of entertainment experiences that are more compelling, accessible and convenient than ever before." Unquestionably, everyone at Marvel Studios is popping champagne and foaming at the mouth over the possibilities that the future holds. We could see the Illuminati fully formed now. We can see an Avengers vs. X-Men movie. We could get an exciting and good Fantastic Four movie. The possibilities are endless now that Disney owns all of the rights. But will they fully explore those possibilities? That's the big question. Or will Deadpool and other possible franchises that are a little off-brand be left out in the cold to some degree?